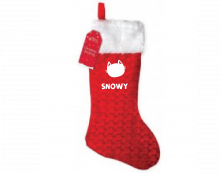 Personalised Red Christmas stockings that make great original presents for your loved ones. A great keepsake gift. Stocking – 40cm (h) X 25cm (w) with the opening measuring at 20cm (approx) complete with a hang tab.